As far as I know, foreigners are required to obtain health certificates to be granted work permits in Vietnam. May I get a health check-up in a Vietnamese hospital to have such a certificate to work in the country? Under Vietnamese law, foreign workers wishing to apply for work permits must fully satisfy the health conditions to perform assigned jobs. In addition to health certificates issued by foreign countries, foreign workers may get health check-ups in licensed hospitals or medical establishments specified in the Ministry of Health’s Medical Services Administration’s Official Letter 143/KCB-PHCN&GD dated February 5, 2015, promulgating the list of establishments eligible for providing health check-ups for foreigners in accordance with the Health Ministry’s Circular 14/2013/TT-BYT dated May 6, 2013, guiding medical examination. Saigon Columbia Asia International Clinic. To be used for application for a work permit, a health certificate must be valid for no more than six months from the date of issuance. Apart from having to get a health check-up at one of the aforementioned licensed establishments, please be advised that medical doctors who perform clinical examination and make health check-up conclusions must be grade-I or grade-II specialized doctors or doctors possessing a master or higher degree as prescribed at Point a, Clause 3, Article 9 of Circular No. 14/2013/TT-BYT. In case I purchase health insurance while working in Vietnam, may I get health check-ups at any medical establishments other than the aforementioned licensed hospitals? What is the level of health insurance benefits under Vietnamese law? 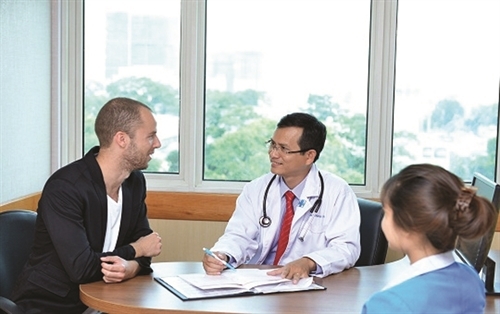 As per Vietnamese law, all medical establishments in the country may now receive foreigners for medical examination and treatment, . However, foreigners who cannot speak Vietnamese need to have their own interpreters while using medical services at these establishments as they might not have any employees who can speak foreign languages. l Lump-sum expenses for the medical examination and treatment are lower than 15 percent of your basic salary.